So much to update you on….. Lots happening last week, as I found some time during my ‘stay-cation’ to catch up on the highest priority koi tasks. It’s the time of year when prioritisation is at it’s most acute; we don’t have enough time to cover off all the tasks we’d like to at their most optimal points, and frankly, the pressure is on after a bumpy start to the season. Underpinning our prioritisation calls, is our overall strategy; our decisions are based on giving me the best shot of a competitive prize at a koi show… The strategy provides direction in the maelstrom of micro decisions. Whilst we have one koi show at the end of September, the ‘All England Show’; the quality at that show is so high, and the breadth of competition so wide… that winning a prize is unlikely. With that show, I am to put out a nice looking vat of home bred fish to show off what I’ve achieved. 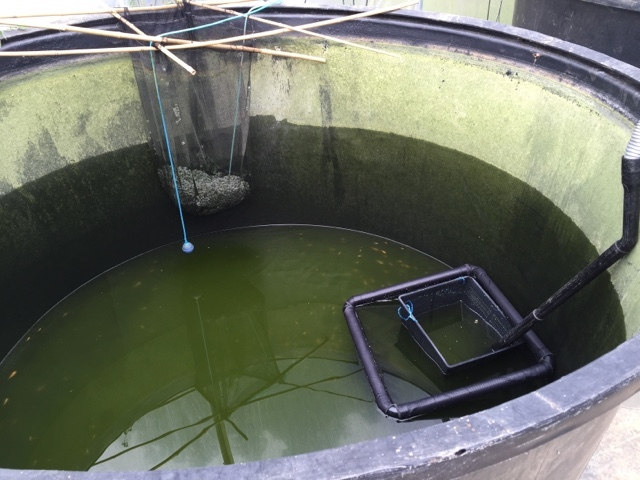 I have one eye on the All England… and the fish I’ll take to that show are from 2015 and 2014 spawnings, and those fish are currently in the males and females tanks. Those tanks are ticking along nicely, so it’s just about maintaining a watching brief. In the case of the females tank, I’m also into growing season… so, the 2015 spawned kohakus in there are still growing and nearer to the All England show, I’ll chose which ones to exhibit and will give them a brief pre show prep. The main show I’m targeting for competitive placings is next year’s South of England show. It’s a great middle size open show, which has a good level of competition. I’ll have one or two nissai and sansai for that show – from 2014 and 2015 spawnings; and to be able to compete in size 1 and 2, I’ll need my fortunes this summer to make a turn for the better sometime very soon! 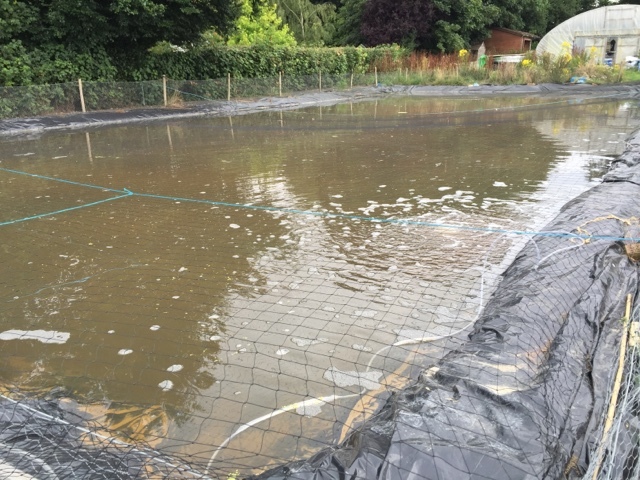 Because so far, this year has been one long series of disasters… Poisonous fry pond water, losing 2 years worth of brood fish purchases in a spawning, and losing the eggs from my new expensive female through fungus.. These have all been major hindrances! There have been lots of plus points too – which I am now drawing strength from. the repeated success of my dianichi males in the spawning vat. 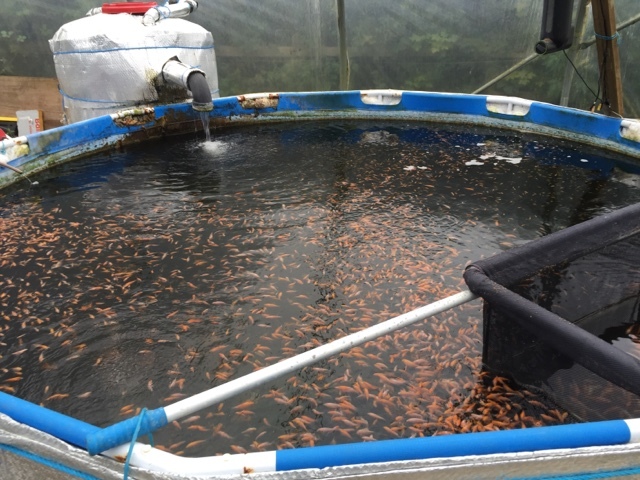 The faster cycling of the fry ponds that we’ve been able to achieve once and then repeat 3 further times, and the fact that we’ve raised a few thousand koi to first selection size despite all the challenges. It’s the first year I’ve been in a position with a few thousand fry from more than one female! We have a few thousand from ‘Sharkey’ (June 16 spawning), and a few thousand from our Okawa female (May 16 spawning). There are also perhaps 500 or so fry almost at first selection size from the 3 step spawning. I selected through both kohaku spawnings; roughly 1500 keepers across the two spawnings. Lots of tolerance applied in the spawnings as we’ve got fewer fry this year (so far!). 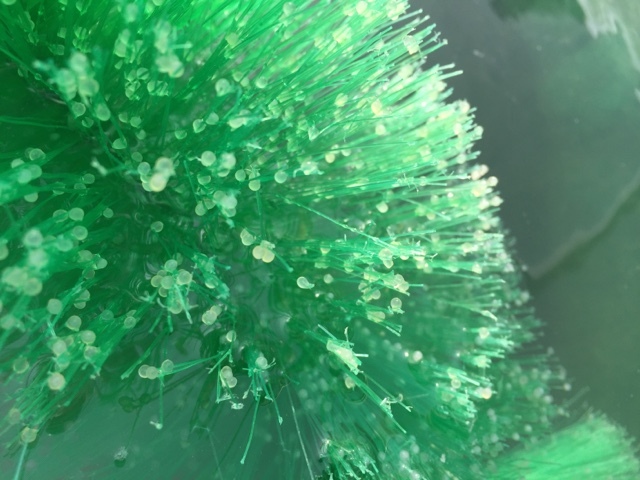 Amanda helped out with selections on the May 16 spawning – her first go at selections. And that helped us get through it more quickly. The keep rate was normal for that parent set, which is around 5% to 10%... And it was interesting to hear Amanda’s comments, with it being her first go. She said, “there aren’t many good ones.. “ That is unfortunately the case with kohaku fry…. 10% with some sort of pattern is pretty good! And I reflected on her comments, remembering how difficult it is to breed kohaku’s and how important it is that we try to rear some more in the remnants of this summer. We raised these fry indoors - the first time we've tried that, and there must have been around 5k fry at around 1 to 2 inches harvested. And, on that. The top fry pond is back up and running, and ready for hatchlings. The bottom fry pond has been drained, dried, and refilled. It appears to be cycling at the same rate at the top pond did over the last few weeks. If I can produce more hatchlings… there’s a chance we have just enough summer left to rear some to first selection size. The first one – we’ll call it, “August ’16, #1” -> I ran a Maruyama female that I’ve had for a few years. She produced a few fry in 2013… but that’s the only year I was able to raise hatchlings and fry from her. This year, I ran her with 2 of my home bred males. Something I didn’t want to do.. but my hand has been somewhat forced. With the spawning accident earlier this year wiping out 2 years worth of brood fish purchases – and in particular – 3 males! I am short on males… I investigated options on a few males I could have purchased and used straight away. My experience over the last few years is that not all males work in the spawning vat … perhaps only half of them. Some don’t get stuck into the spawning, some are more fertile than others, or have better fertilising technique than others etc. The end result is…. They don’t all work out. And each one is a sizable investment, and the problem is that most of my koi purchasing funds are spent up… so you see, losing those 3 males in the early season spawning has left me in a predicament. Money spent, risk taken, and risk crystallised! I’ve started to raise new funds by selling some fish I no longer need – like my 3 shiro’s; and also some of my home breds that I wanted to keep for a few years, but have made the tough decision to let go so that I can start to rebuild my brood stock. After a lot of reflection and discussion – balancing off the prospect of using better genetics with new males, and having to make quick decisions on which ones to go for -> vs the lower cost of using my home breds….. I decided to use what I already have and see how that works out, and then go from there. This also gives me time to fully consider how I top up my brood stock, making more strategic purchases - rather than knee jerk gap filling purchases. In the end, only a proportion of males will deliver good fertilisation rates in a natural spawning, from my experiences. So, it’s worth trying my home breds out to see if they even meet this first important criteria. It seems that finding males that fertilise a good proportion of the eggs is one of the first challenges – so if my home breds do the business, I may hang onto them as backup options for future years. And if they don’t fertilise the eggs, they can be sold to help raise funds. The second spawning, which I’ll call “August ’16 #2”. This is a repeat of the May 16 spawning --> same parent set, used for a second time. This is also the same set as july 14, and may 15… ie, the one that’s produced 2 baby champs. It’s the 4th time I’ve used these males in a spawning this summer – and they’ve done the business on the 3 times so far.. could they deliver a 4th time ? And the scores on the doors…. The August ’16 #2 spawning went brilliantly. High fertilisation, and a decent number of eggs. She is a star! And the males must also take some praise! This brood set have regularly produced good fertilisation rates. As the week progressed, and I could see there was potential for a great hatch, I carved out some extra time to give the eggs the best possible chance. 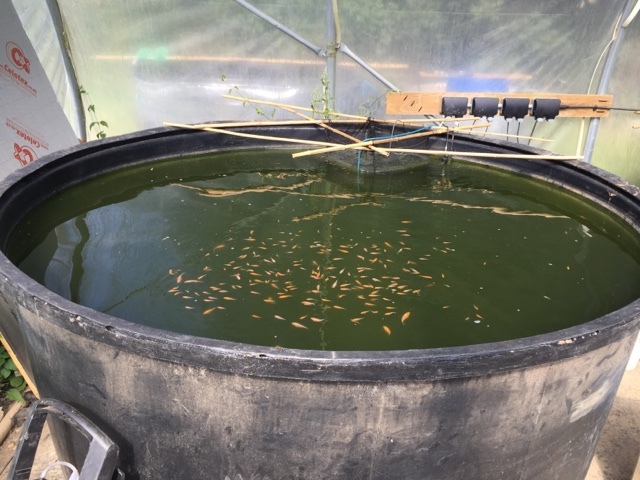 I recycled the black tub that was in use, growing on a test sample from the june spawning … I drained, harvested the 500 or so fry in there, cleaned, then refilled the tank. That gave me a spare vat, and I split the eggs from the successful August ’16 #2 spawning with around half staying in the vat where the spawning took place, and the other half moved to the newly set up vat. The hatch in both vats was good and we have enough hatchlings to fill one, and potentially enough to cover both outdoor ponds! The August ’16 #1 spawning went well too. And, my home bred males fertilised roughly 50% of the eggs. Not bad for their first outing! 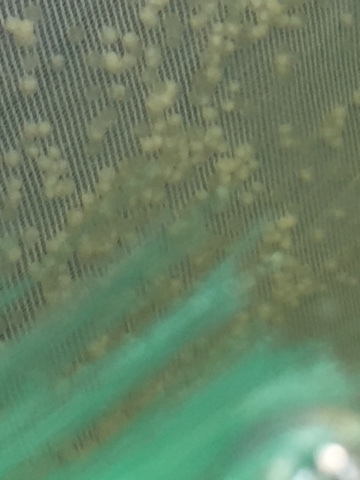 Eggs 24 hrs after spawning - clear ones are live, the white ones are not. Learning the lesson from the fungus attack on the eggs from the 3 step female a month ago, when I lost most of the batch… . with this spawning – I hit the tank harder than I normally would with malachite green and that seems to have held the fungus at bay. The hatch was ok, but water quality has been a struggle to maintain in this vat. I usually split the eggs into different vats, but I ran out of vats. And therefore, the eggs from this spawning had to stay in the same vat that the spawning took place in. Water quality has been difficult to maintain despite daily water changes. 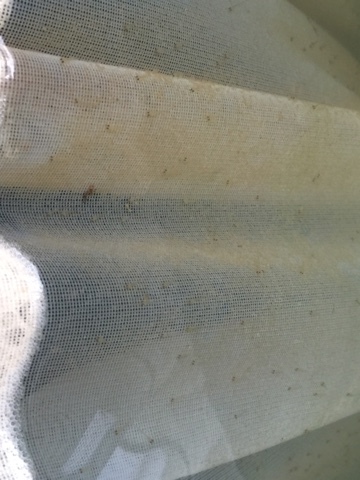 The end result is that we have hatchlings… but water quality is still ropey, and hanging by a knife edge. And I’m pretty sure the poor water quality led to a lower survival rate than I’d have liked. Part of my prioritisation calls has been to focus my available time on the eggs from the other spawning – a much higher fertilisation rate, and from a parent set that’s produced show prize winners for 2 consecutive years…. Outside… the top fry pond is ready for hatchlings. Daphnia is blooming, and we’re learning that we will need to raise the fry for a week or two indoors and fatten them up a bit so they are large enough to compete for the abundant, larger food source. And here’s the thing… summer is running out. So, it’s a race to grow the hatchlings quickly enough so that they are large enough to the daphnia before we put them into the fry pond, balanced off against maintaining water quality in the hatchling rearing vat with make shift filtration and water changes (not enough time to do as much of this as I’d like), and to hope that the water quality holds out long enough for us to get them to a large enough size. 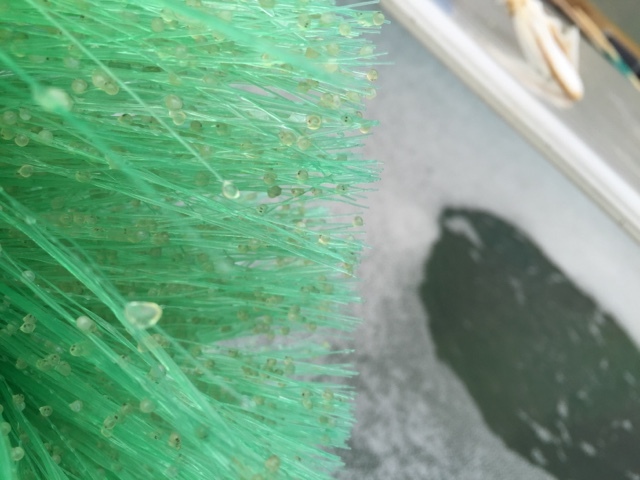 If we get it wrong – either, they take too long to reach the size where we can put them outside, and summer will run out before they reach harvest size.. Or, we push them too hard in the rearing vat, and water quality deteriorates and we lose the hatchlings. These are the kinds of decisions that is typical of a home breeding project…. The right set of decisions, and you can end up with a large harvest. The wrong set… and you can easily end up with almost nothing, or nothing. The results will become apparent over the next couple of weeks.